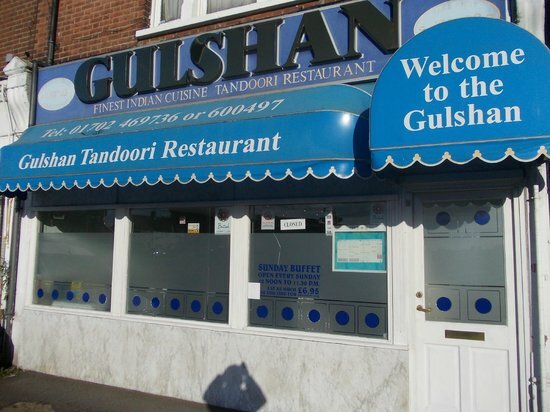 I had the unplanned pleasure earlier today at eating at the Gulshan Tandoori Restaurant (Sutton Road, Southend near the Greyhound shopping complex). We (Mrs B and me) made the spur of the moment decision to eat our Sunday lunch at what is our nearest “Indian” eating place. We have eaten there before, but it was a long time ago, so a return visit was long overdue. It is a cosy, unpretentious place, clean, simple and pleasant, although not I feel having great atmosphere or being situated in a great location. I did like the friendly, chatty Bangladeshi staff / owner though. Today the restaurant served its Sunday buffet: a wide enough choice of traditional Indian fare, and it was eat as much as you want. My wife started with a cup of tea and me a Kingfisher lager (what else) but otherwise we stuck to the buffet, resisting the temptation of the traditional poppadoms and dips. I made my own starter: Onion Bhaji, Vegetable Samosa and Chicken Pakora with Naan bread and salad, which all had the wow factor and set the tone for what was to follow. For main course I mixed the sort of chicken and lamb meat dishes that are common these days in Indian restaurants, along with mushroom biryani, aloo and vegetable curry. My wife had similar and we ate until our stomachs were full. All the food was delicious and the low price was impressive. The service, other than the food itself that was serve yourself, was good to great and included at the end niceties like a hot towel and the complimentary chocolate. If I had a quibble, and it was very minor, the temperature for the starters was not as piping hot as my ideal and while the main was very good, it didn’t quite wow as much as the starter. But it was an enjoyable meal, leaving me wondering why it had taken us so long to pay that return visit and resolving to visit again soon and maybe sampling the take away service. I felt sad that we saw only two other customers in the time we were there, because the restaurant deserved more patronage. Because it offers superb value for money, the Gulshan now ranks among the best Indians I know. It is on our return to soon list. I look forward to our next visit. ← Homelessness – what to do when it is really cold?